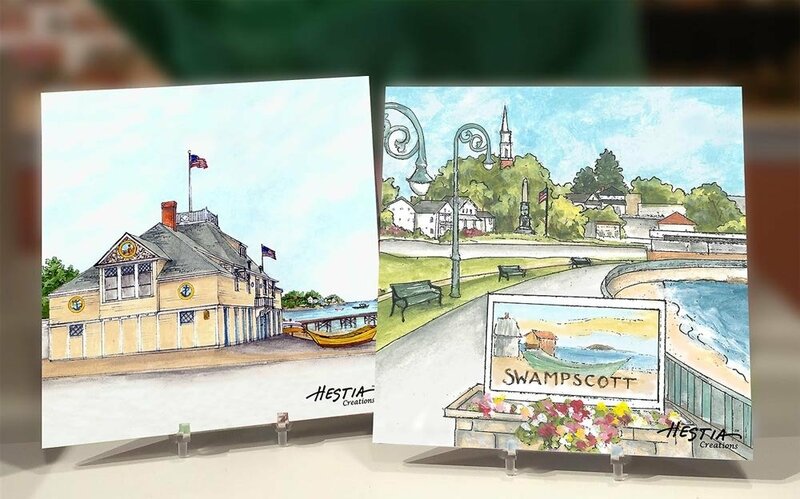 Our Swampscott trivets feature one of two hand painted watercolors from the easel of our own studio artists. One trivet shows Swampscott's famed fish house. Built in 1896, the Fish House now houses the Swampscott Yacht Club and public junior sailing program. Our Entering Swampscott watercolor shows the sweep of King's Beach leading up to Red Rock and the beginning of Swampscott's shopping district. The trivets are carefully printed to ensure an accurate reproduction of our original artwork. Each one has a cork backing and makes a useful and beautiful addition to any home!